Visit the polling places page to find your polling place. I am a college student where do I vote? Where you vote depends on what address you last registered to vote at. If you are unsure contact your Secretary of State to find out. Do I have to put my college address when I register to vote? No. You can register in the state you are from or the state where you attend school, the choice is up to you. Just remember if you choose to register where you are from (outside of Brazos County) you will need to contact that county and get an absentee ballot mailed to you. I moved since I last registered. Do I need to re-register? Yes, you need to register at your new residence. If the deadline has passed to register in the place where you live now, request an absentee ballot from your previous address (if outside of Brazos County). After the election be sure to fill out a new voter registration form with your current address. I registered last year but never got my voter ID card. Am I registered to vote? Check with your Voter Registration Department to see if you are registered. You may have filled out the form incorrectly or be registered but just never received the card. The deadlines are typically posted on the home page of this site. Where can I register if the deadline has not passed? Click here to get the form online or pick up a form at the Voter Registration office. To confirm your voter registration status click here. What if I can't make it to my polling place on Election Day? 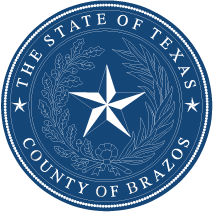 You can vote early: Brazos County has early voting starting 15 days before election day for registered Brazos County voters. If you're registered outside of Brazos County your county/state may offer a mail in or an absentee ballot. Keep in mind, you must already be registered to request an absentee ballot or a mail in ballot. I lost my voter registration card. Do I need it to vote? No. You can bring a valid Texas Drivers License or click here for a list of all acceptable forms of ID. What if I go to the polling place on Election Day and they say I am not registered to vote but I know I am? Everybody has the right to vote provisionally. This means you cast your ballot just as you would anyway, but it goes into a special review process where they verify your registration status. To find out if your vote was counted you will have to contact the Election Coordinator.